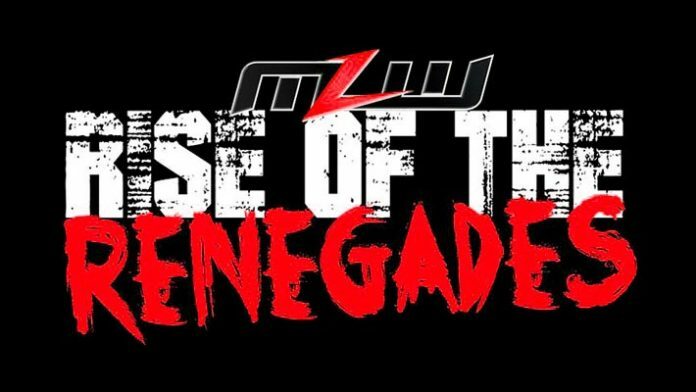 Major League Wrestling has announced two new matches for Rise of the Renegades, which takes place Thursday, April 4th from New York City at the Melrose Ballroom. Former MLW World Middleweight Champion Maxwell J. Friedman will clash with MLW tag team champion Brian Pillman Jr. Both men are only 22 years old, but have already made their mark. After MJF and Richard Holiday’s recent attack on Teddy Hart, Pillman looks to get revenge on behalf of his Hart Foundation partner. Also confirmed for Rise of the Renegades, Sami Callihan returns to MLW against league newcomer Mance Warner. These two matches are in addition to the previously announced double header main event. “Filthy” Tom Lawlor puts the MLW World Championship on the line against Jimmy Havoc Plus, LA Park will face Pentagon Jr.
MLW Rise of the Renegades kicks of two nights of MLW Fusion TV tapings. If you’re in the NYC area for WrestleMania 35 weekend, visit MLWTickets.com for ticket information. The night after Rise of the Renegades, MLW presents Battle Riot II. The 40-man anything-goes battle royal will air live on beIN SPORTS. The winner earns a shot at the MLW World title. The 5th competitor has been announced: the human jumbo jet, Ace Romero.